The adventure is a perfect for a first time trekker as the walk is easy for most part of the trek. We will get to cross several river streams. There are clear blue skies above us and dense forest of chestnut and deodar on our left. Our walk will be mostly along playful river streams and beautiful waterfalls. The climbs are gentle and not too taxing on your feet. Their are open meadows in the middle of our trail ideal for a perfect camp site. Their is an abundance of bird and wild life as the variety includes parakeets, cuckoo, owls, minivets, bulbul, monal, koklass pheasat, Western Tragopan, Steppe Eagle, Golden Eagle, The Himalayan Snowcock and bearded vulture. The area comes under Govind Wild Life Sanctuary which is home to around 150 species of birds. 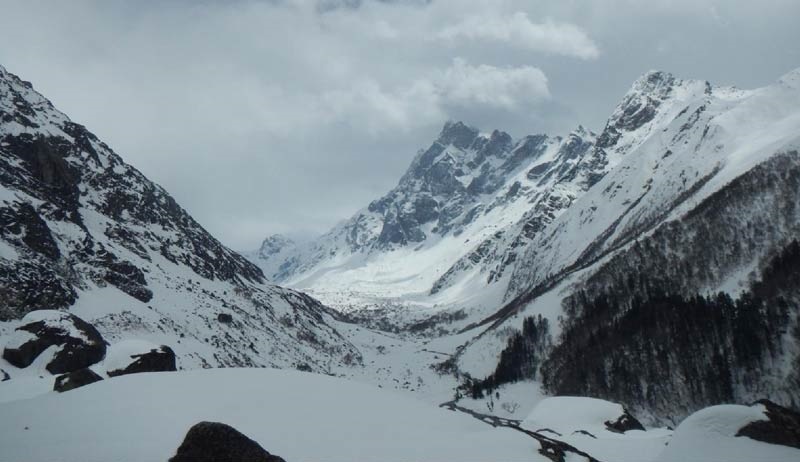 The area is also home to the exotic and rare snow leopard on it's upper reaches. The people in the area follow strange customs as they worship and revere Duryodhana and Kauravas, the antagonists of the Hindu Epic Mahabharata. This trail leads to the route to Swargarohini, the way to heaven as per the legend of Mahabharata. The trail leads us through alpine meadows, moraine, glaciers, ancient villages and pine forests and offer us mesmerizing views of the valley and wonderful landscapes. 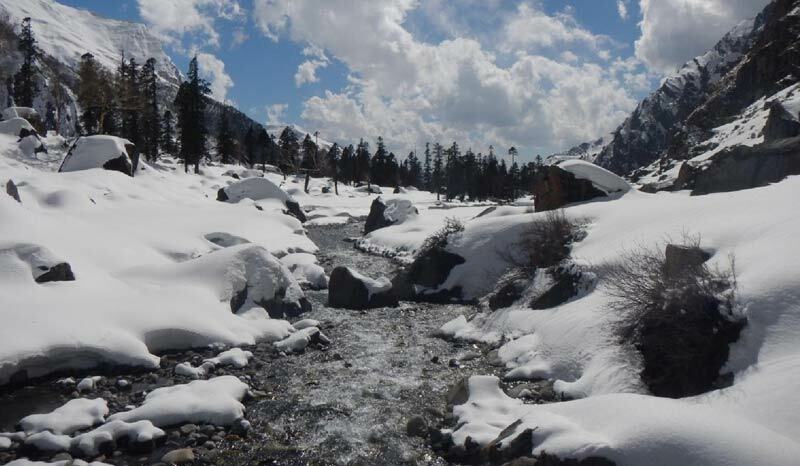 Situated at an altitude of 3500 meteres, Har ki Doon stays covered with snow from October-March and offers magnificent views of famous peaks of Swargarohini, Bandar Poonch, Kala Nag or Black peak and Har Ki Dun peak. Today will be a long journey so we would not have much time for sight seeing, Dehradun to Sankri is 10-12 hours drive via Mussorie along hills and will take our entire day. So it's advisable for trekkers to arrive early in the morning and proceed for Sankri. We will take a break near Mussorie for breakfast and click pictures, enroute we will also get to view Kempty falls from afar, after a series of hair pin bends, magnificient views of Yamunotri and Kedarkantha Peaks, criss-crossing remote himalyan villages and coming across many rivers such as Yamuna, Kamalganga, Kedarganga, Supin and Tons we will reach our destination Sankri, which is a small beautiful village nestled amid scenic views of Himalayas. It is the last village connected by bus in this area and lies inside Govind WildLife Sanctuary. 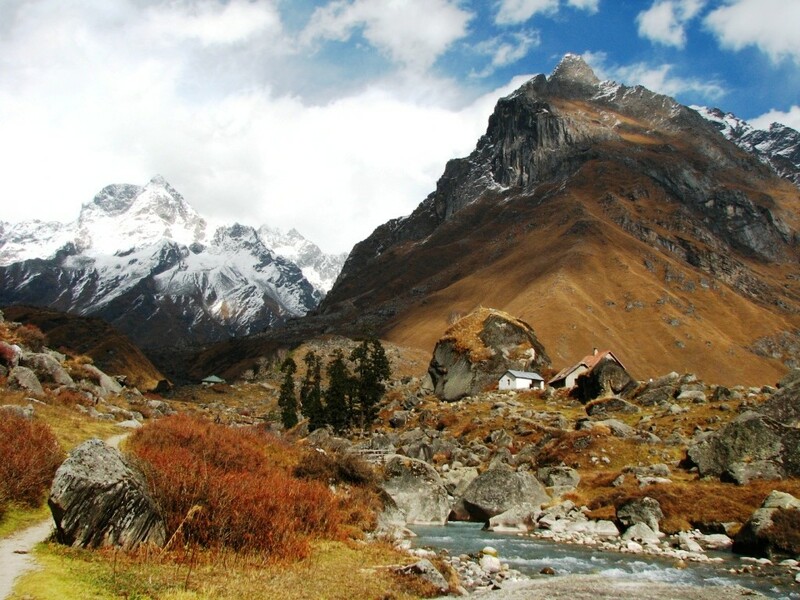 Sankri is also not far away from basecamp of Kedarkantha trek and is situated at an altitude of 1950 meters. Overnight stay in a guest house in Sankri. It's a gentle walk of 4-5 hours from Sankri to Taluka over plains along Supin River. It's a scenic hike going past wild roses, chestnut and cedar trees. We will come across some streams and waterfalls along our way. Taluka is a vast meadow near a small village with concrete houses. There are small eateries (Dhabhas) nearby. In spring the pastures of Taluka are filled with wild aromatic flowers. We camp overnight at Taluka amid open skies and enjoy sumptuous dinner and bonfire before retiring in our tents. We will start today after a nourishing breakfast and will pack our lunch. There is mostly a level walk heading east along the river for about 40 minutes, which will bring us to a bridge. After crossing the bridge we will reach a small meadow where we can see two paths branching out, we will choose the left path along the river and walkside along side the right of the river. After a while the path turns and we will find ourselves climbing a mountain through a gentle gradient amid green forests. It's best to start early as we will get ample time to savour the sights and enjoy the beauty of the forest. After a while we will come across a small bridge and another 30 mins climbing after crossing the bridge. From here there is a short level walk to Gangad Village. We will take a break for some tea and snacks at the nearby eatery and open up our packed lunches while savouring the beautiful views. We will recross the river and continue walking for another few hours and reach cultivated fields. We have reached near Seema/Osla (a village with two names). There are a few eateries here, we will bite on some snacks and have tea and then proceed for an hours long walk towards Debsu Thach which is a large pleasant meadow and a beautiful place to camp . We will camp here and enjoy good food and bonfire before going to sleep in our tents. If we are starting from Seema/Osla but not Debsu Thach than we have to start early today and after breaksfast cross a river. Heading North East, we cross a little bridge if its not been washed away in that case we will use boulders. After a while we will see an enchanting little waterfall emerging from tree-fringed mountains. About another half a kilometer we will reach an intersection, we will take the path branching off towards north-west across the river and 30 minutes walk from here will take us to Debsu Thach. From here we will start from an obscure path leading down to the forest towards the east on a steep gradient. It's a thick forest with lots of leaves on ground and the path might be slippery depending on weather conditions. We can hear a roar coming from a nearby stream, another half an hour stretch from here will take us to Ruinsara Stream. We will cross the stream and halt for a little tea-break along the roaring stream, playfully leaping against boulders on terrific speeds. From here there is a moderate climb for about an hour towards south-east and an easy level walk along the stream flowing below us. Tread carefully here as the path might be slippery on washed away patches due to incessant rains and a slip could lead to a fatal fall hundreds of meters below. A few more hours from here on a level walk will bring us to a nice open space with a shelter where we will halt for lunch. From here the path begins to climb shortly thereafter on a moderate gradient with a few steep patches. We will come across some beautiful waterfalls as we tread alongside a mountain and cross a stream. From here there is a 40 minute descent to the river bed on a marshy and waterlogged area. From here we will head south-east on a clear path for about an hour until we reach a stream. Depending on water levels and time of the day we may cross the stream with great care and with instructions of your guide or choose to camp here. If we cross the stream then a 30 minutes moderate climb followed by an equal amount of level walk will lead us to a lake nestling at the base of the mountains. This is Ruinsara Lake. The waters are clear and inviting for a swim. There are beautiful views of the nearby surrounding peaks as we see Yamunakanta pass leading to Yamunotri, Banderpoonch Peak (6400 meters). Ruinsara Lake is considered sacred by the surrounding villages. It is above the main valley floor on the true side, surrounded by alpine pastures and low rhododendrons beneath the impressive Swargarohini Range. We camp here tonight beside the pristine lake. Today will be a mostly level walk on an easy trek, however it's best to start early as its a long trail. We will pitch our tents in this pleasing meadow and go for a short walk in the forest grounds. Enjoy the beautiful sun-set and enjoy the beautiful views before retiring in your camps. From Debsu Thach, we head north-west and descend towards a bridge across the river. The site is muddy and slippery thus requiring careful negotiation. A 30 minute level walk between wheat fields will bring us to a path going north-east from where 2-3 hours climb will take us to a meadow with rolling grass and alpine flowers. We would halt here for lunch break. Another 2 hours walk from here and we will cross the meadow and reach the forest. From here a few hours down the moderate slope and criss-crossing a rickety bridge and a 30 minute ascent followed by an hour long level walk will bring us to Har ki Dun Gad (Stream) from where we cross another rickety bridge and climb for a short while to reach our camping site. Enjoy the beautiful views of snow covered mountains on the north and a stream with several rivulets flowing on the grass. 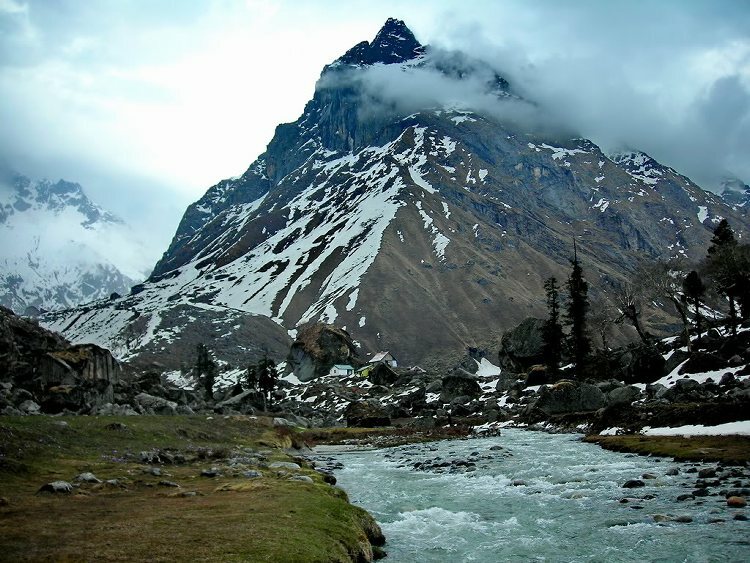 The peaks of Swargarohini and Har ki Dun are towering above. We camp here tonight. After an early morning breakfast we continue our trek towards Juandhar Glacier (4300 meters), it's a vast stretch of snow spread in 55 kilometrers with patches of green grass. As we feast our eyes with picturesque glaciers and the valley post. After spending some time here playing with snow near the base camp of Swargarohini Peak, we will begin our descent back to Har ki Dun and at our camping site. Today we will be traversing back towards Osla which is a 11 kilometers stretch. Although the trek would be a little difficult and steep but the scenery and atmosphere would be encouraging. After a long and tiring day we will reach Seema/Osla back into our camps and enjoy a hearty meal and drink adequate water to avoid dehyradation. We will relax and enjoy campfire and go for an early sleep as tomorrow will be another long day back to Sankri. Today will be a long and tiring day as we will be traversing for 26 kilometers through steep terrains and beautiful scenery with sights of bird life and snow clad peaks. Some uneven climbing will be also involved as we pass through wild life sanctuary and observe the eautiful flora and fauna with a pleasant weather and enviornment thus uplifting our moods. It will take us 6-7 hours to finally arrive back to Sankri which will be our final destination on foot. We will camp here tonight and give our bodies the much deserved rest after the long journey. Tomorrow our cabs will be waiting for you to transport you back to your hotel in Dehradun/Mussorie.